If we had anything like a reasonable energy policy in this country, the government would be doing its best to remove regulatory obstacles and excessive costs to building nuclear power plants. Most people think of nuclear power as being much more dangerous than other forms of producing energy and incidents at places like Chernobyl and Fukushima have not helped nuclear power’s image. Still nuclear power is cleaner than any fossil fuel in terms of pollution and waste products and safer in terms of lives lost at all stages of production. In the United States alone, over 100,000 coal miners have been killed in accidents in the past century. The worst nuclear accident in history, at Chernobyl, may have been responsible for 4000 deaths. Even some environmentalists are coming around to the idea that nuclear power is not so bad. Still, nuclear power is not without its drawbacks. So far, when we have spoken of nuclear power, we have meant power obtained by nuclear fission, that is power obtained from the breakup of radioactive atoms, usually uranium. Nuclear fission reactions can yield millions of times more energy than any chemical reaction, which includes burning fossil fuels. There is another type of nuclear reaction which yields even more energy than fission and does not leave any radioactive waste. This is nuclear fusion. Nuclear fusion is the opposite of fission. Instead of a relatively large atomic nucleus breaking apart, fusion occurs when smaller nuclei smash together, forming a larger nucleus, the most common reaction would be hydrogen atoms fusing together to create helium. The actual steps involved are a little more complicated than that, but the details are not important. Every star in the universe is powered by fusion power. We have managed to produce fusion reactions here on Earth in the form of hydrogen or thermonuclear bombs. While these weapons are very destructive, they are not very useful in production the power we need. For that, we need to learn how to produce a controlled fusion reaction. The trouble is that atomic nuclei, being positively charged, are mutually repelled by the electro-magnetic force. Protons and neutrons inside a nucleus are held together by the strong nuclear force, which is far stronger than the electromagnetic force but has an extremely short range. In order for nuclei to to pushed close enough for the strong force to work, the temperature has to be very high, the core of the Sun is 15.7 million Kelvin or 28 million degrees Fahrenheit. This is a problem. 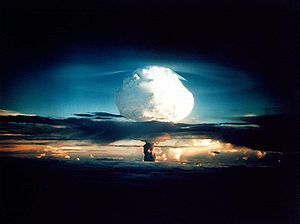 We can get temperatures that high on Earth, in a nuclear explosion. We can even get temperatures that high in the lab. The problem is that the plasma heated to such a high temperature must be contained, somehow, or it will disperse before any useful reactions take place. There is no substance on Earth that would not be instantly vaporized at that temperature. Which leads me at last to the article in the Independent on the latest progress in making fusion power a reality. An idyllic hilltop setting in the Cadarache forest of Provence in the south of France has become the site of an ambitious attempt to harness the nuclear power of the sun and stars. It is the place where 34 nations representing more than half the world’s population have joined forces in the biggest scientific collaboration on the planet – only the International Space Station is bigger. If Iter demonstrates that it is possible to build commercially-viable fusion reactors then it could become the experiment that saved the world in a century threatened by climate change and an expected three-fold increase in global energy demand. Nothing is left to chance in a project that has defied potential Babel-like misunderstandings between the collaborating nations. The design, development and construction of a machine that will attempt to emulate the nuclear fusion reactions of the Sun is proving to be a triumph of diplomacy, as well as science and engineering. “It is the largest scientific collaboration in the world. In fact, the project is so complex we even had to invent our own currency – known as the Iter Unit of Account – to decide how each country pays its share,” says Carlos Alejaldre, Iter’s deputy director responsible for safety. “We’ve passed from the design stage to being a construction project. We will have to show it is safe. If we cannot convince the public that this is safe, I don’t think nuclear fusion will be developed anywhere in the world,” Dr Alejaldre said. “A Fukushima-like accident is impossible at Iter because the fusion reaction is fundamentally safe. Any disturbance from ideal conditions and the reaction will stop. A runaway nuclear reaction and a core meltdown are simply not possible,” he said. Conventional nuclear power produces energy by atomic fission – the splitting of the heavy atoms of uranium fuel. This experimental reactor attempts to fuse together the light atoms of hydrogen isotopes and, in the process, to liberate virtually unlimited supplies of clean, safe and sustainable energy. Nuclear fusion has been a dream since the start of the atomic age. Unlike conventional nuclear-fission power plants, fusion reactors do not produce high-level radioactive waste, cannot be used for military purposes and essentially burn non-toxic fuel derived from water. The roots of the Iter project go back to 1985 when Mikhail Gorbachev, General Secretary of the former Soviet Union, offered his country’s prowess in nuclear fusion as a bargaining chip in the nuclear disarmament talks with the US, which at that time was pursuing its “Stars Wars” defence system. Gorbachev and President Reagan, with the support of Margaret Thatcher and French President François Mitterand, signed an agreement to cooperate on nuclear fusion using the Russian “tokamak” reactor. This was a revolutionary device that could hold the super-hot fusion fuel by creating a “magnetic bottle” within the reactor’s doughnut-shaped vacuum vessel. Several experimental tokamak reactors around the world, including one at the Culham Centre for Fusion Energy in Oxfordshire, have shown nuclear fusion is theoretically possible, but the giant tokamak at Iter will be the first to generate more power than it needs to attain the very high temperatures required for nuclear fusion. The Iter tokamak machine, which is twice the linear size and 10 times the volume of its nearest rival at Culham, will produce temperatures of well over 100 million C – many times hotter than the centre of the Sun. It is the first experimental fusion reactor to receive a nuclear operating licence because of its power-generating capacity. For every 50 megawatts of electricity it uses, it should generate up to 500mw of power output in the form of heat. A critical phase of the project will be the injection of plasma – the superhot, electrically-charged gases of the atomic fuel – into the reactor’s vacuum chamber. This plasma, a mix of the hydrogen isotopes deuterium and tritium, will drive the nuclear-fusion reaction. The plasma will be heated to temperatures as high as 300 million C to force the atomic nuclei close enough together to cause them to fuse into helium, a harmless and inert waste product that could be recycled as an important industrial raw material. Giant electromagnets powerful enough to trap an aircraft carrier will contain the plasma within a spinning vortex held by the magnetic bottle of the tokamak reactor. There is more to read there. All I can say is hurry up, the sooner fusion power is practical for the large scale production of electricity, the better. Bad science writing 101 (breitbart.com) Well yes, I think there is some sort of regulation to mention climate change in every science article.